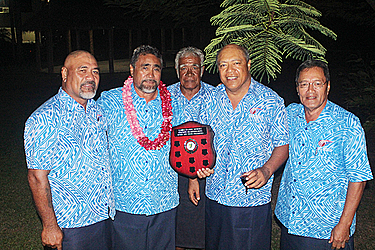 And so it was for competitors in the Pacific Senior Cricket Championship held at Tuana’imato for the past 10 days. On Tuesday night, the tournament wrapped up during a gathering at the Samoa Tourism Authority Fale where Prime Minister, Tuilaepa Sa’ilele Malielegaoi, mixed and mingled with the players. “We always enjoy playing host to any sports or conferences here in our small island country,” Tuilaepa said. Hosting this tournament was no exception, he added. General Manager of the Samoa International Cricket Association, Salā Stella Tagitau, spoke about the friendships and bonds that have been developed during the tournament. “I want to thank the Pacific Senior’s Group for a wonderful ten days of fun, cultural exchange, friendship and fantastic cricket,” she said. “We have witnessed amazing batting, bowling, fielding and running and it goes to reaffirm that age is just a number. President of the Victoria Senior Cricket, Greg Johnson, in response acknowledged Sala and her team for a job well done. He promised to return and they will also help to develop young Samoan cricketers. “What a fantastic time we have had here in Samoa,” he said. “It’s wonderful in life when you have a life experience that exceeds your expectations. We all have gone on holiday not knowing what to expect and I reckon this trip and tournament exceeded our expectation, it has been a wonderful tournament. The formalities ended with the exchanging of gifts.